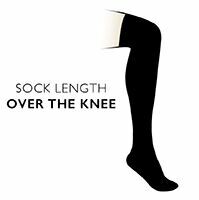 Soft, warm and comfortable, in a gorgeous wool rich blend with a feel like the smoothest silk, these Trasparenze Dora Ribbed Wool Over The Knee Socks bring texture to your look, creating excellent opportunities for your outfits, like layering over tights or wearing on their own with a shorter skirt. Ribbed socks have an instant casual look, as well as adding to the warmth they provide. Manufactured in Italy, these wool rich socks are comfortable and well made, with elasticised tops and reinforced toes. If you prefer full leg cover, tights are also available.